The Mystery Bookshelf, where you can discover a library of new mysteries, is pleased to feature a new mystery series title we recently received from the publisher. 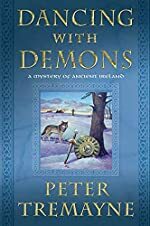 About Dancing with the Demons (from the publisher): In the late 7th Century, the High King of Ireland is killed at night in the middle of his compound. Who killed him is not in question -- there are unimpeachable witnesses that point directly to the clan chieftain responsible. Dubh Duin is, after all, found by the High King's guards in the High King's bed chamber holding the murder weapon. But with impending civil war in the balance, the motive for the murder becomes of paramount importance. The Chief Brehon of Ireland asks Fidelma of Cashel -- sister to the King of Muman and a dailagh -- to investigate. What her investigations reveal is an intricate web of conspiracy and deception that threatens to unbalance the five kingdoms and send them spiralling into a violent and bloody civil war and religious conflict. And it's up to Fidelma to not only see to justice but to prevent the violent fracturing of an increasingly fragile peace. About the author: Peter Tremayne is the fiction pseudonym of Peter Berresford Ellis, a renowned scholar on the Ancient Celts and the Irish. As Tremayne, he is best known for his stories and novels featuring 7th century Irish religieuse Fidelma of Cashel. He lives in London. Visit his website based on the series character at SisterFidelma.com.